The selection and variety of clearomizers continues to grow and one of the latest I’ve tried is the Micro Core ADC II from SmokTech. Similar to the EVOD in design, this clearomizer sports the latest SmokTech “M-Core” coil head along with adjustable airflow. The overall design of the ADC II is familiar, with a profile much the same as the original EVOD from Kanger. A chrome mouthpiece and bottom bands compliment a nicely finished painted midsection that is available in a wide variety of colors. That body is metal, surrounding a Pyrex glass tank. 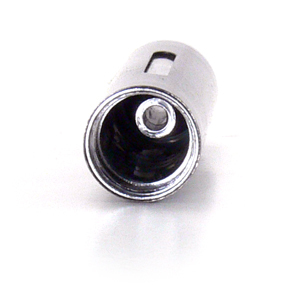 The base of the clearomizer unscrews for filling and coil head replacement, but the mouthpiece is not removable. 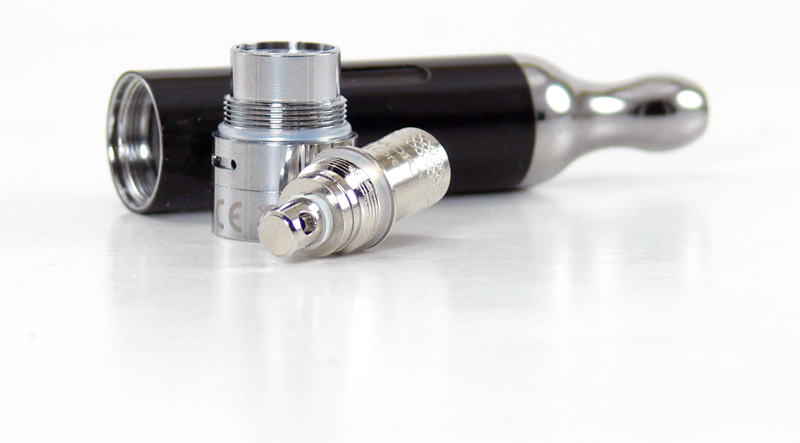 There are open slots on each side of the metal body which makes it easy to see e-liquid levels. 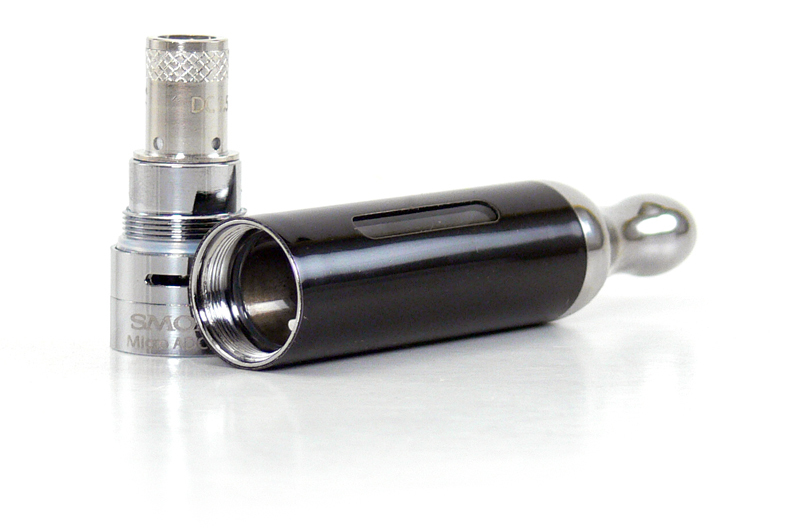 Like the EVOD and other clearos of this type, it only has eGo style threads, so an adapter is required for use on 510 only devices. 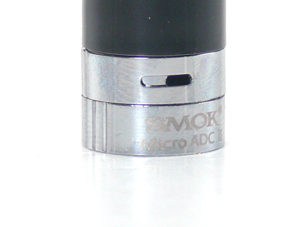 The base of the ADC II is where the real improvements in the clearomizer are found. Most obvious is the small adjustable airflow band found just below the tank section. Turning the band opens and closes airflow slots on opposite sides of the base. The band turns with just enough resistance to minimize accidental changes. The other improvement is in the coil head. 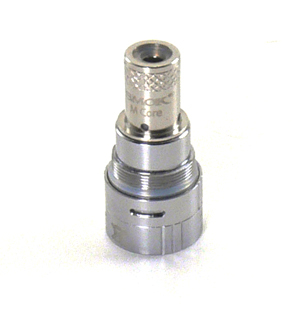 The M-Core is a dual coil design found in much of the new SmokTech line. The noticeable difference from earlier heads is the lack of a protruding chimney. These heads seal against the center tube much like newer heads from Kanger and Aspire, among others. Juice flows into the head via four holes around the base, where it then soaks into an outer sleeve and on to the coil wicks. The new coil head system works quite well in the ADC II, with good performance right from the start and no burnt hits and no gurgling or leaking. That’s actually pretty impressive to me since many of the EVOD and even the larger style bottom coil clearos I’ve tried have had some issues. Not so much with leakage, but with dry hits. I often find myself “priming” clearos with stock coil heads, either by puffing into them or pulling on them once or twice before firing. I’ve had no such issues with the ADC II, it has provided nice even flavor and warmth right from fill to finish. The adjustable airflow works great. At fully open it provides a very airy draw with almost no resistance. Fully closing the slots results in a very restricted draw, but not closed completely. I found myself using it with only about a quarter of the slot open, but I tend to like a fairly tight draw. Filling is a very simple process, just turn it upside down, unscrew the bottom and fill. As with any bottom coil, you do need to be careful to fill along the sides and avoid getting any e-liquid in the center tube. In this case, that requires that the body be kept at a fairly sharp angle when filling because the center tube is recessed quite a bit. It’s down so far in fact that it does not seem like the ADC II will hold the advertised 2ml, but it does, thanks to a hollow area in the tip. The design actually works quite well, as it eliminates the overfilling that often causes wicking issues. Speaking of wicking, there are also adjustable replacement coils available for the ADC II that incorporate an adjustable wicking system. The concept is intriguing to me, as I have not had much luck with the standard coil heads and always end up recoiling and re-wicking to suit my tastes. With the good performance of the included coil and the option of using an adjustable wick head, it seems like nearly any thickness of liquid should work well. I have not replaced the included coil with the adjustable yet, but when I do I’ll be sure to update this page. Incremental updates are often a good thing and that applies to the Micro Core ADC II. It doesn’t break any new ground in terms of outward design, but it does improve on a style that has become a staple in the vaping world. Consistent performance coupled with the adjustable airflow make this a good choice for beginner and experienced vapers alike. At $6.99 from Madvapes it is quite reasonably priced, especially considering that replacement coil heads are only $1.79. The SmokTech Micro Core ADC II reviewed above was purchased from Madvapes for the purpose of this review.